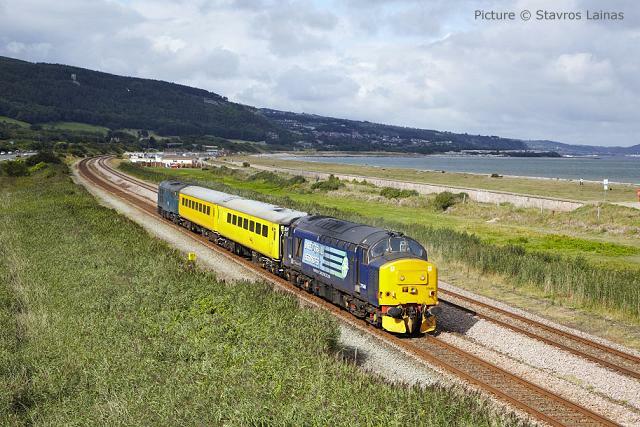 This site is dedicated to all our regular contributors and supporters, and especially the rail staff of North Wales. This list may be out of date if you are reading an archived page. For the current list visit our Calendar. Birkenhead CH41 1HB American model trains running 13:00 to 17:00. Admission £2 - ample free parking. Nearest Station Birkenhead Park. Contact 0151 653 0637or j.elliott37[at]sky.com for more information. 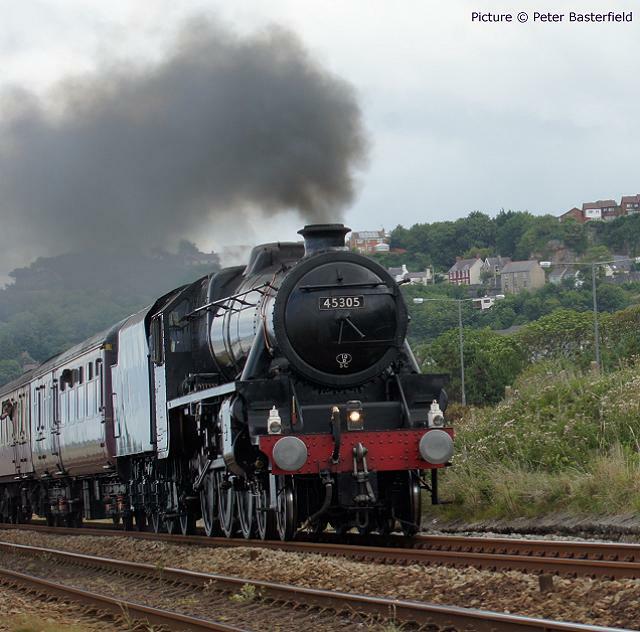 Sunday 1 September Steam on the Coast Railway Touring Company 'North Wales Coast Express' steam-hauled Manchester Piccadilly - Altrincham - Chester - Holyhead and return. Note, does not start from Crewe due to engineering works. Cancelled. 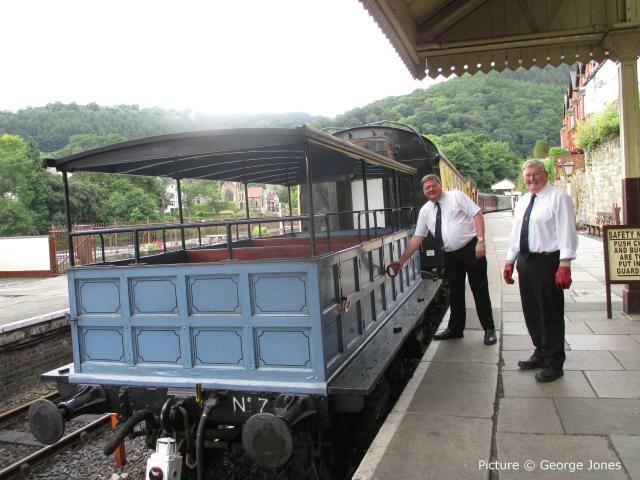 Preston - Frodsham - Llandudno Jc - Blaenau Ffestiniog and return. Loco 45305 or 61994. 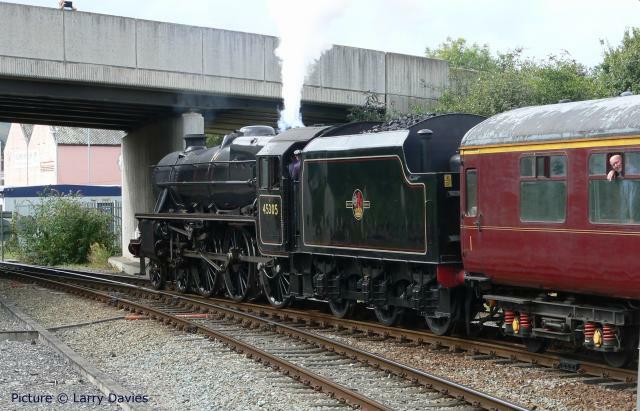 Friday 6 September Clwyd Railway Circle Larry Davies '1962, A year of so much change' Major changes were about to happen on the national network; Larry shares his observations with us. 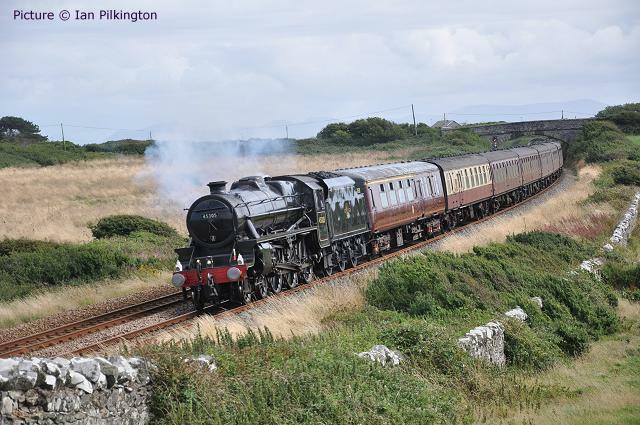 Sunday 8 September Steam on the Coast Railway Touring Company 'North Wales Coast Express' steam-hauled Liverpool - Chester - Holyhead and return. Note change of route. 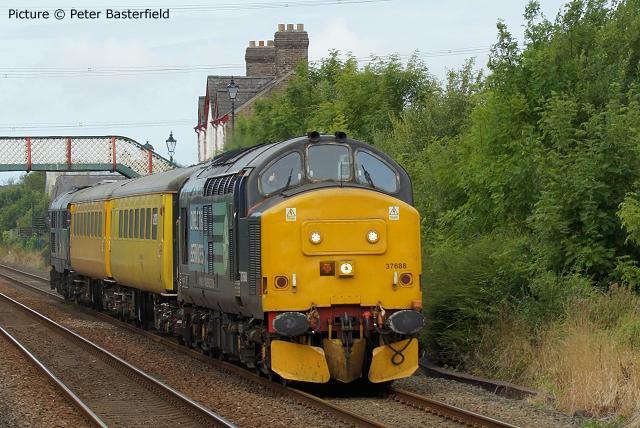 Wednesday 11 September Excursion Mid-Cheshire Rail Users Association Settle & Carlisle Express Scenic Railtour. Outward journey via the Settle & Carlisle Railway, a stopover in Carlisle and returning via the Cumbrian Coast line. This year the train starts at Hooton, then picks up at Chester, most stations on the Mid Cheshire Line, Stockport and Reddish South. As usual, there are reserved seats, a buffet car, trolley service and a MCRUA detailed route description. 28 September Community Rail Festival at Llandudno and Blaenau Ffestiniog in conjunction with the Community rail awards. Friday 4 October Clwyd Railway Circle Ian Mainprize 'Narrow Gauge Railways of the Harz Mountains' The talk comprises a section by section description of the narrow-gauge system, each section being illustrated by a map followed by photographs taken by Ian during the early 1990's. The history, infrastructure, rolling stock and locomotives are covered, and the railways are placed in context with regard to the history, geography and people of the area. 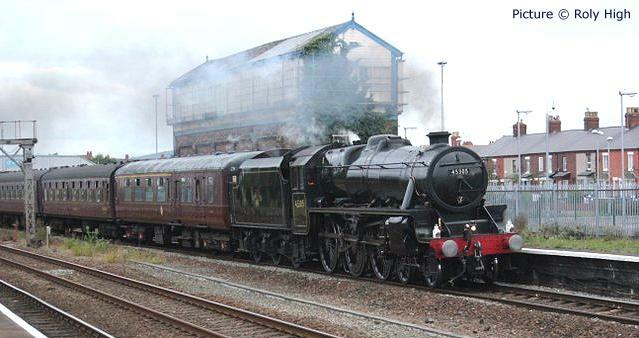 Saturday 5 October Steam at Chester West Coast Railway Company 'Welsh Borders Steam Special.' 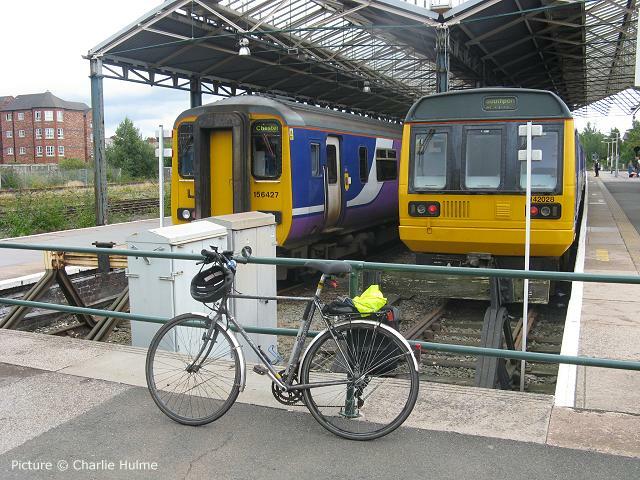 Cleethorpes - Shrewsbury and return. 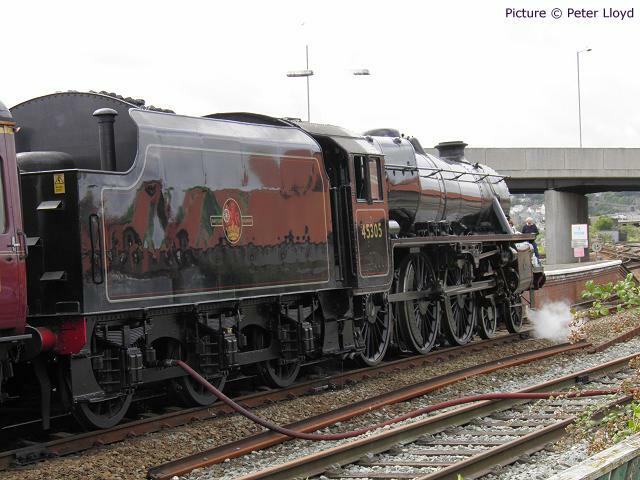 Steam-hauled Crewe - Chester - Shrewsbury - Whitchurch - Crewe by 44932, 45699, 46115, or 48151. 5/6 October Manchester Model Railway Society Exhibition Armitage Centre, Moseley Road, Fallowfield, Manchester M14 6ZT. Friday 11 October Altrincham Electric Preservation Society TRAINS IN THE SNOW By Dr Les Nixon. Over 60% UK including much pre-1968 steam, 20% foreign including South Africa, Turkey and Peru. 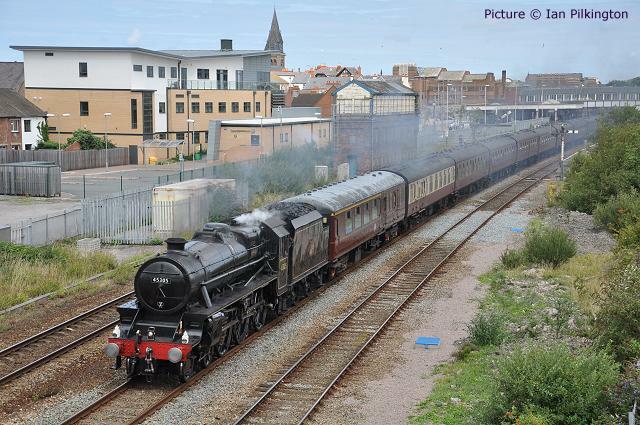 Saturday 19 October Steam at Chester West Coast Railway Company 'The Cheshireman' Cleethorpes - Chester. 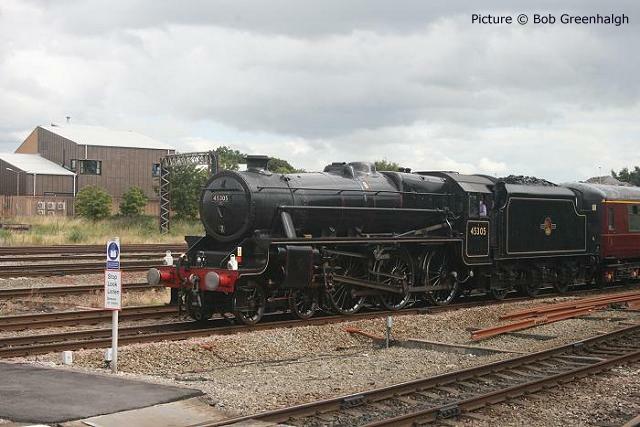 Steam-hauled by 70013: Cleethorpes - Doncaster - Sheffield - Altrincham - Chester - Doncaster. Thursday 24 October Locomotive Club of Great Britain Noel Coates "The L&YR in B R Days"
Friday 1 November Clwyd Railway Circle Paul Davies 'The Buckley Railway and the Industries it served' The talk celebrates the 150th Anniversary of the railway. Saturday 2 November Wirral '0 Gauge' Group Open Day, Unit 7, The Odyssey Centre, Corporation Road, Birkenhead CH41 1HB British model trains running 13:00 to 17:00. Admission £2 - ample free parking. Nearest Station Birkenhead Park. Contact 0151 653 0637 or j.elliott37[at]sky.com for more information. Members are invited to give a 15/20 minute presentation of their choice (any format). This will be interrupted by festive treats (all high calories). Members must book their slot no later than 16th November by telephoning David Jones. Thursday 19 December Locomotive Club of Great Britain John Ryan "Various Gauges in France and Spain 1966 to 1973"
26-31 December Llangollen Railway Mince Pie Specials. 1 January 2014 Llangollen Railway Mince Pie Specials. 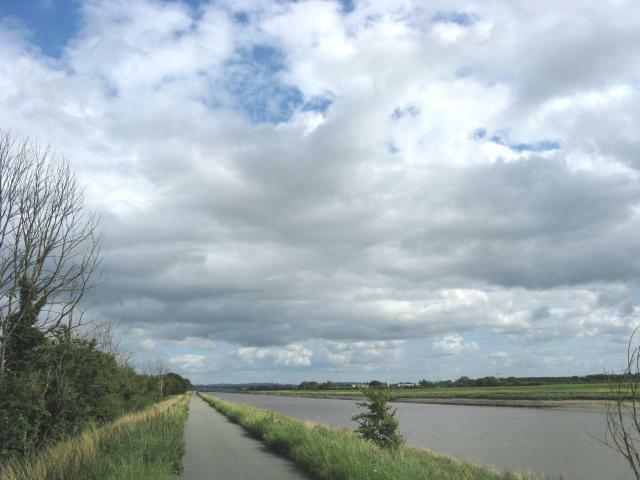 Friday 3 January Clwyd Railway Circle David Rapson 'Wrexham to Bidston Line' A history of the route illustrated with pictures covering the last 70 years. Friday 7 February Clwyd Railway Circle Brian Bollington & Peter Hanahoe 'Polish Steam' The presentation is a mix of slide shows and video showing steam on the national network, including shed scenes, taken in the 1990’s. 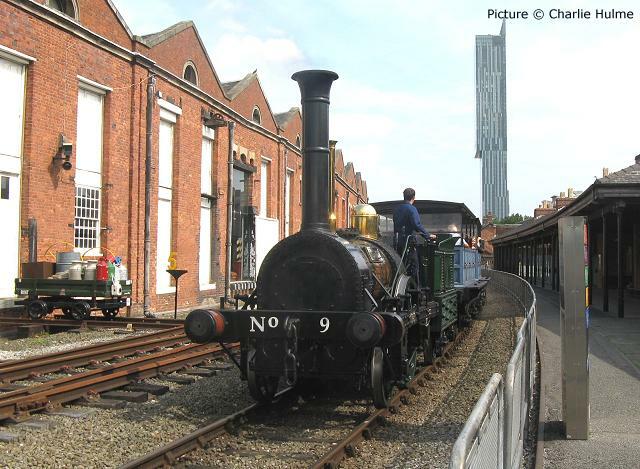 Friday 7 March Clwyd Railway Circle The Committee & David Southern AGM followed by the talk 'Railways of the Wirral' After the formality is over, we can look forward to Dave sharing his railway experiences of 60 years living on the Wirral. Thursday 20 March Locomotive Club of Great Britain Dr Michael Bailey "The Manchester Ship Canal Railway"
Friday 4 April Clwyd Railway Circle Ron Watson-Jones 'The Irish Mail Train Crash at Penmaenmawr Aug 1950' Ron’s account of the accident on 27th August 1950. Thursday 17 April Locomotive Club of Great Britain Norman Matthews "Steam in Central America"
Thursday 15 May Locomotive Club of Great Britain AGM and Members/Visitors Slides & Digital Photos. 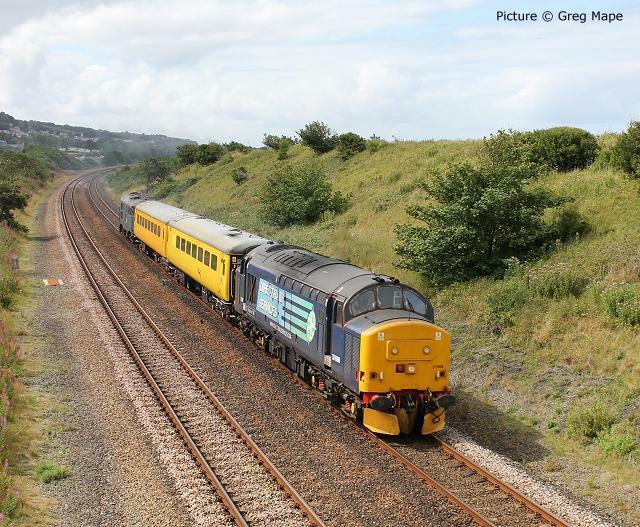 37 688 Kingmoor TMD heads the Network Rail measurement train near Abergele, 18 August. Picture by Stavros Lainas. Welcome to an extra issue we've inserted to cope with all the recent events. The 19 August issue is still available, and the next one will appear as normal, late on Monday 26 August. The locomotive Planet and two vintage passenger coaches have arrived at the Llangollen Railway on 19 August for a a brief filming session on the Llangollen Railway, to be used in a feature about the English artist William Turner, whose famous work 'Rail, Steam and Speed - The Great Western Railway' (1844) features a loco of similar general appearance, albeit broad-gauge. 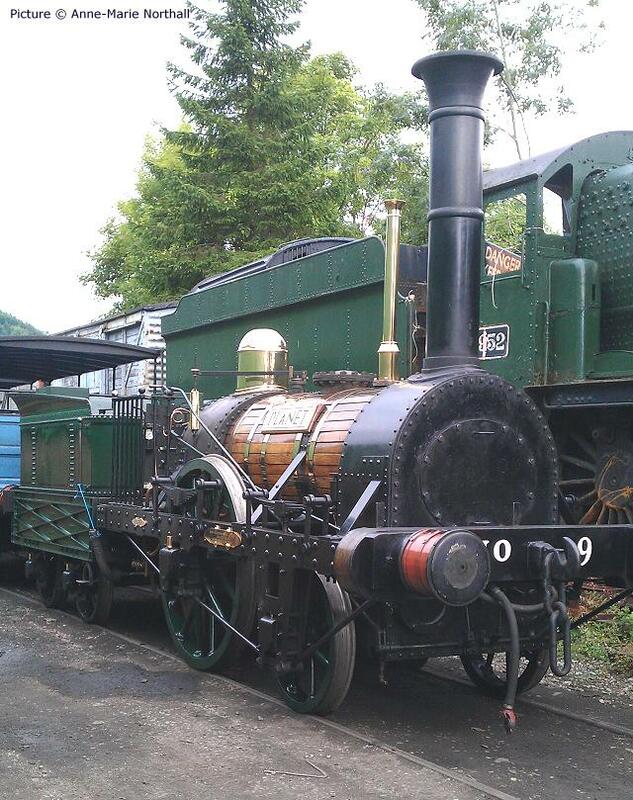 The picture above was taken by Anne-Marie Northall in Llangollen yard. Planet normally resides at the Manchester Museum of Science & Industry; it is a modern replica of a locomotive design as used on the original Liverpool & Manchester Railway, opened 1830; it was built at the Museum workshops, and completed in 1992. 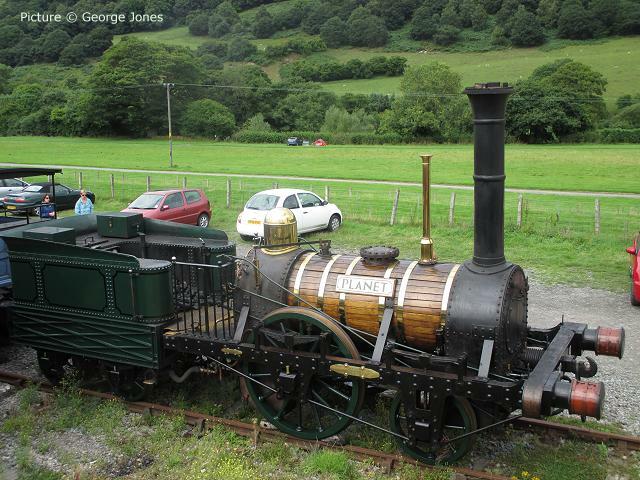 It's visit follows earlier appearances, in 2002, of the other L&MR replicas - Rocket, Sans Pareil and Novelty - which came to take part in a re-creation of the Rainhill Trials of 1829 which was based around the station area at Carrog. Planet and one of its coach went up to Carrog late on Saturday 17 August, and on Sunday 18 August it was on static display at Carrog behind the signalbox (above) and attracting attention. Picture by George Jones. The other coach went up attached to the rear of the 11am service train (George Jones). It was locked out of use despite interest in sampling an open air ride! These coaches are also replicas, built on the underframes of British Railways wagons. Planet in its normal environment, the Liverpool and Manchester Railway's original terminus at Liverpool Road where it works services at weekends on the Museum's short line, currently under threat of truncation by the planned Ordsall Chord line. Picture by Charlie Hulme. 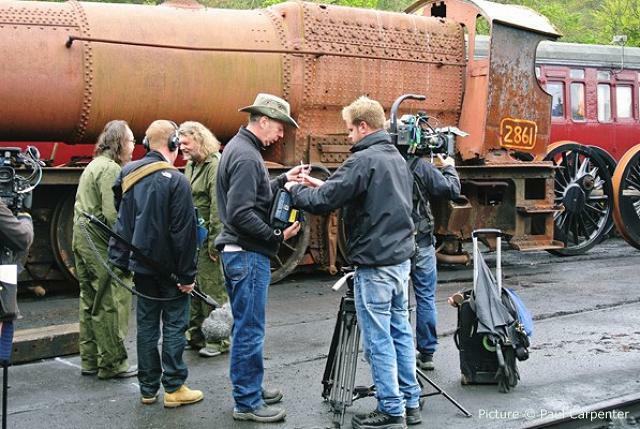 Speaking of the Llangollen Railway and the media, readers might have glimpsed the line in the opening sequence of the BBC's 'Hairy Bikers Restoration' series currently being shown. The third episode, to be shown on BBC2, Sunday 25 August at 9pm (and for some time afterwards on an iPlayer-fitted PC near you), features the hirsuite pair, no doubt complete with humorous banter, helping with the 'Night Owl' project to re-create a Great Western 47xx 2-8-0 using parts of other Great Western locos including 2861, seen in the picture taken by project manager Paul Carpenter during the filming. Improvement work to the Grade II-listed Cefn Mawr viaduct is taking place between Saturday 24 August and Sunday 1 September inclusive. All long-distance trains that normally use the Wrexham route will be diverted via Crewe. 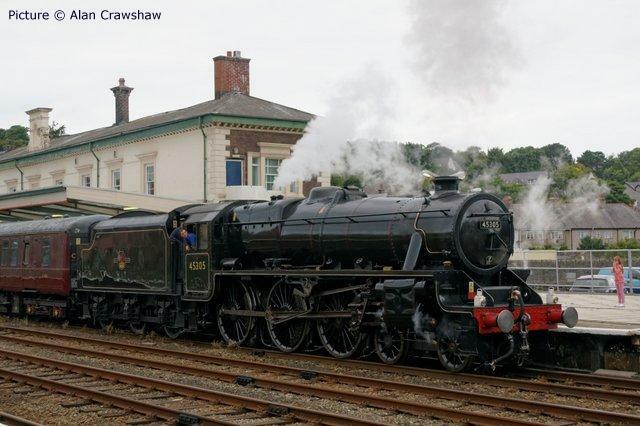 Replacement buses will run between Shrewsbury and Wrexham General calling at Gobowen, Chirk and Ruabon, and there will be shuttle trains between Wrexham and Chester running approximately hourly. 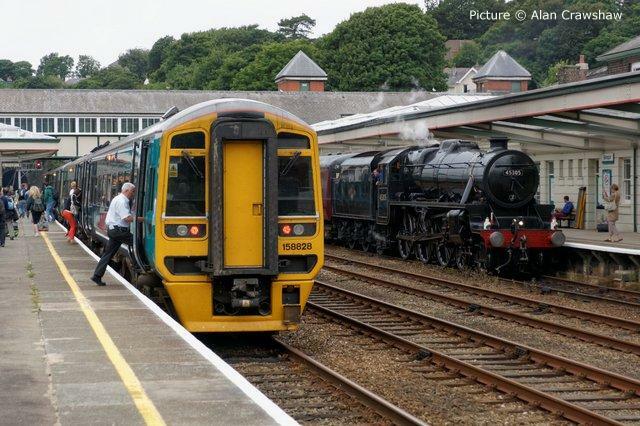 The 05:33 Holyhead to Cardiff Premier service will run later than the normal timetable from Chester to Cardiff arriving in Cardiff approximately 35 minutes after the normal time. 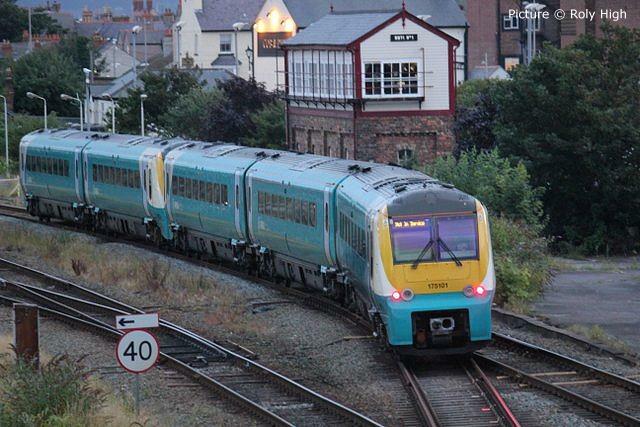 See the Arriva Trains Wales website for more information. This means, of course, that visitors by public transport to the Llangollen Railway will need to transfer to the replacement bus, and allow more time for their journey. On a related topic, the X94 bus route from Wrexham to Barmouth, the former rail replacement service introduced in 1965 by Crosville when the line from Barnouth to Ruabon closed, no longer calls at the purpose-built interchange at Ruabon station. Rail passengers alighting at Ruabon and wanting the bus service to destinations beyond Corwen to Bala, Dolgellau and the coast (such as the Bala Lane Railway) will have to walk down the Station Drive to the bus stop on Bridge Street to catch the X94 - similarly for the drop off point for in bound services to Wrexham. The service (see timetable) remains two-hourly for the main part of the day but there is no evening service now. The railway station stop will continue to be served by the GHA/Bryn Melyn route 5 to Llangollen, every 15 minutes, mostly hourly to Corwen, in the main part of the day. Route 5A runs hourly on Sundays. See the Timetables ... and when travelling be sure to hold on to your seat! 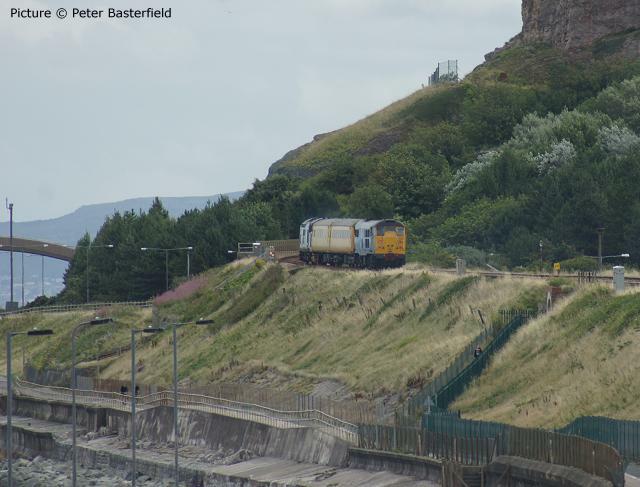 Sunday is a day of the week when many people enjoy a leisure trip to the seaside, or other visitor attractions, but unfortunately it is also a day when the Railway likes to run things to suit its own convenience rather than that of passengers. Of course engineering work has to be done, but some of the arrangements for the alternative train service seem to leave a lot to be desired. Consider Sunday 18 August, when Joanna and I travelled from Stockport to Chester to ride the cycle routes to and from Hawarden Bridge. 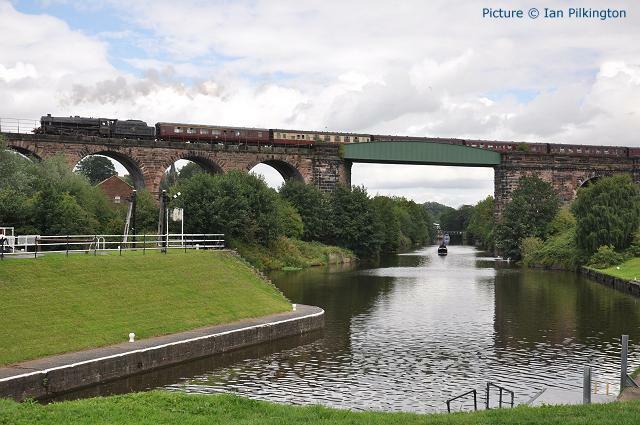 The route from Manchester to Chester via Warrington was closed, leaving the Cheshire Lines route via Northwich to handle all traffic to North Wales, including the steam-hauled 'North Wales Coast Express' (see article below). Northern Rail were, as usual, running their two-hourly Southport - Chester via Northwich Sunday trains, and Arriva Trains Wales a non-stop Manchester - Chester service, also over the Cheshire Lines route. 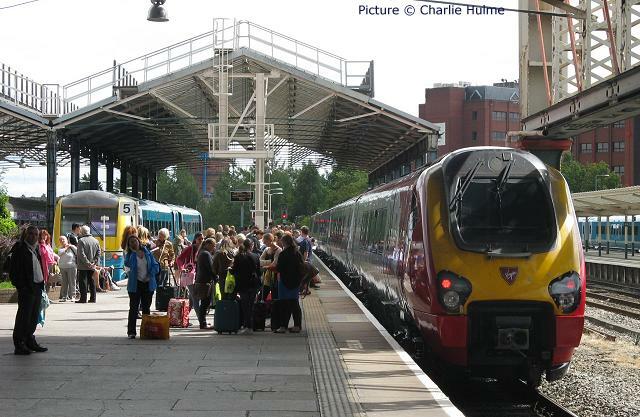 Passengers for North Wales were compelled to change at Chester. Our train was the 10:05 Southport - Chester, calling at Stockport 11:31 and due Chester at 12:46; Northern Rail had thankfully strengthened this working to four carriages. Not far ahead of us was the steam special, which had started from Crewe diesel-hauled 40 minutes late, but regained most of the time on the journey to Manchester (where it reversed) and left Stockport, with 'Black 5' 45305 hauling, towards Chester just 10 minutes late at 11:10. Unfortunately it then lost a little more time, reaching its planned stop for water at Greenbank station at 12:06 and standing there until 12:22, now 22 minutes late, by which time the Northern train was standing at the signal outside the station. After more signal checks we arrived at Chester at 13:10 instead of 12:46. Another Northern unit was stabled in bay Platform 6, which is too short for six coaches, so I got to 'bash' the other bay, Platform 5 (see picture). 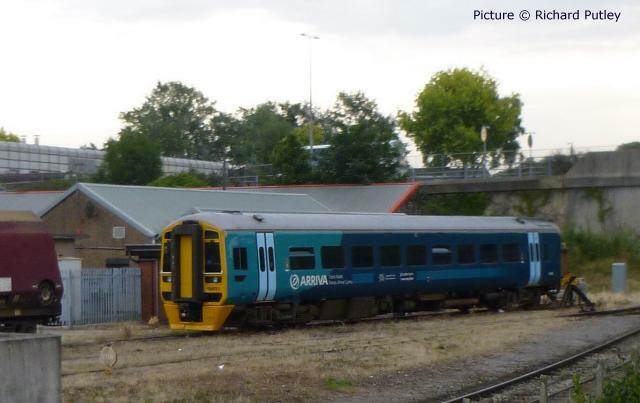 That train left to return to Southport 10 minutes late at 13:14, to be replaced in Platform 5 at 13:17 by Arriva's 11:48 non-stop train from Manchester (below), due at 12:59, which had been stuck behind us. But what then faced North Wales passengers? The Crewe - Holyhead train, 13:02 from Chester, had left on time and was already somewhere near Flint, with the next train from Chester towards Holyhead at 14:06. 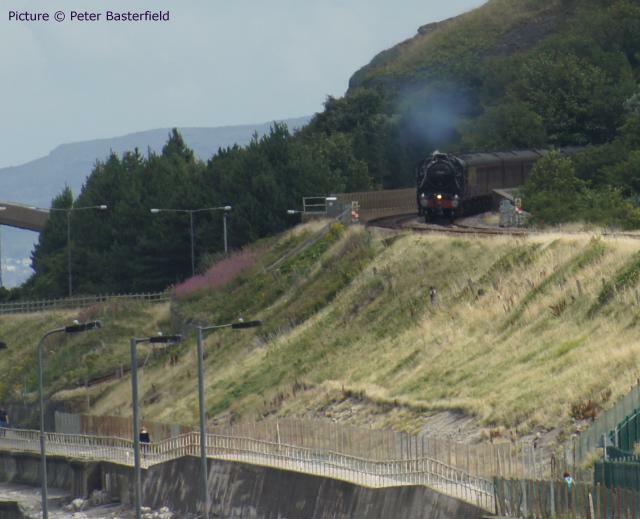 Anyone then hoping to get to the seaside at Llandudno would have had to change again at Llandudno Junction, arriving Llandudno at 15:38. Even if everything had been on time, the three-minute connection at Chester between the Arriva train from Manchester at 12:59 in Platform 5 and the North Wales train in Platform 3 at 13:02 was not feasible, so they would have had to travel by the Northern all-stations service, giving a Manchester - Llandudno journey, with two changes, of three and a half hours, much of it perhaps in a less-than-luxurious Class 142 'Pacer.' Is this really the best service that can be provided? 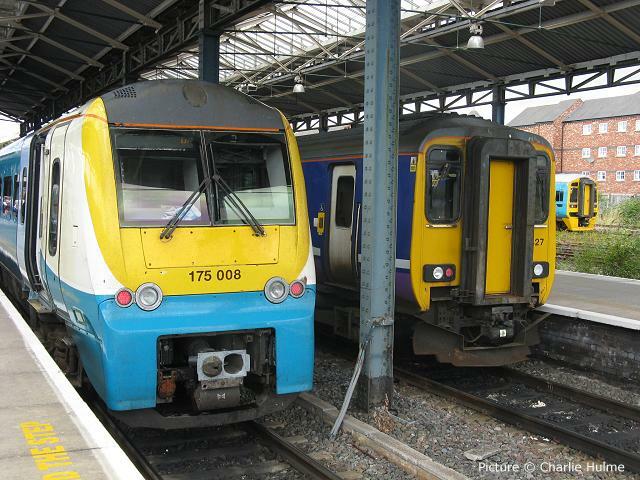 Why not plan to couple the train from Manchester to the one from Crewe, for example? Meanwhile, 221 113 Sir Walter Raleigh had arrived at 13:08 as empty-stock (5D35) from The Bombardier at depot Barton-under-Needwood depot. Picture by Roly High. Soon lots of people were standing on Platform 4 alongside the 'Voyager'. As for the cycle ride, it went well once we negotiated the un-signed diversion round a towpath blockage in Chester, and on the way back found a way through the city centre having found a locked gate on what the OS map showed as a public route round the racecourse, although not part of the official circuit. By sheer luck we arrived at Hawarden Bridge station just in time to photograph 150 264 on the 14:59 Bidston - Wrexham service departing. I hadn't realised that all trains on Sundays (not that that there are that many) stop at this station by request, in contrast to weekdays when only morning and evening peak trains call. The wide smooth cycle routes - more information - are paradise compared to what is provided in the Stockport area. Crossing Northwich Viaduct over the Weaver Navigation (Ian Pilkington). Arriving at Chester (Bob Greenhalgh). 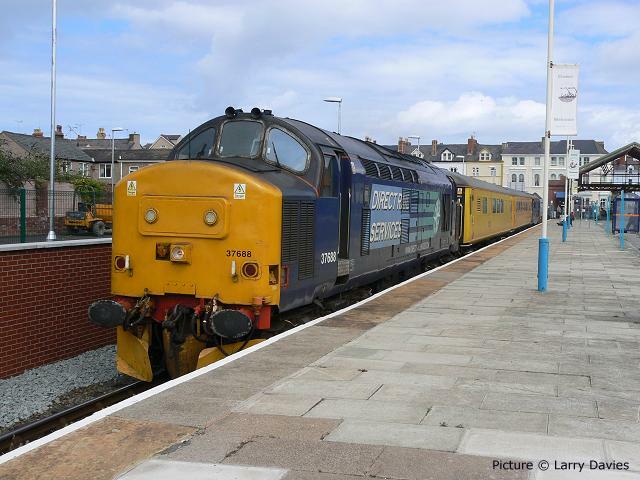 Passing the long closed Rhyl No 2 box (Ian Pilkington). 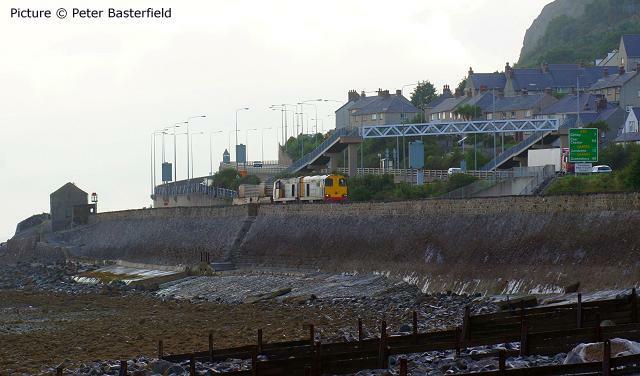 45305 heads out of Penmaenrhos tunnel and down towards Colwyn Bay, with the North Wakes Coast Cycleway below (Peter Basterfield). Alongside the A55 at Colwyn Bay (Jack Bowley). 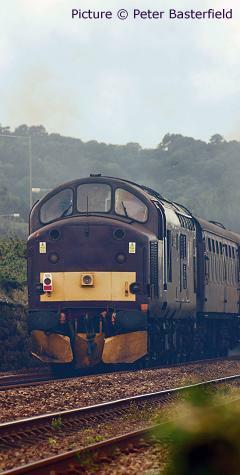 45305 takes a drink from Llandudno Junction's fire hydrant; the hose is draped across the siding (Peter Lloyd). 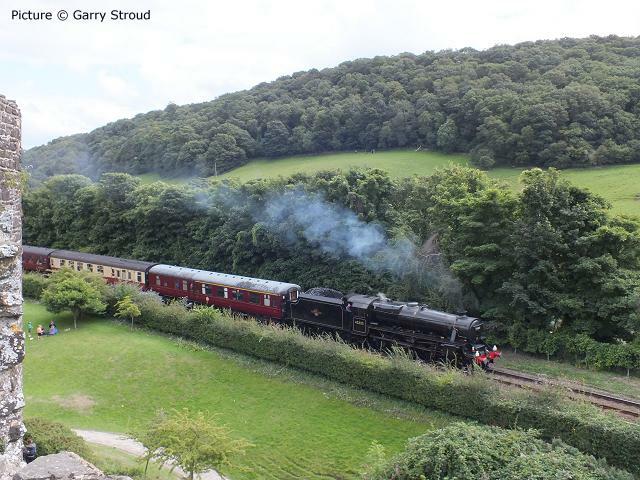 From Conwy town walls (Garry Stroud). Heading for Penmaenmawr (Peter Basterfield). 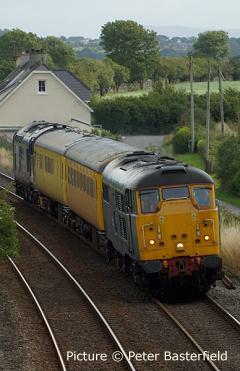 Rounding the curve at Llanfeilog east of Rhosneigr (Ian Pilkington). 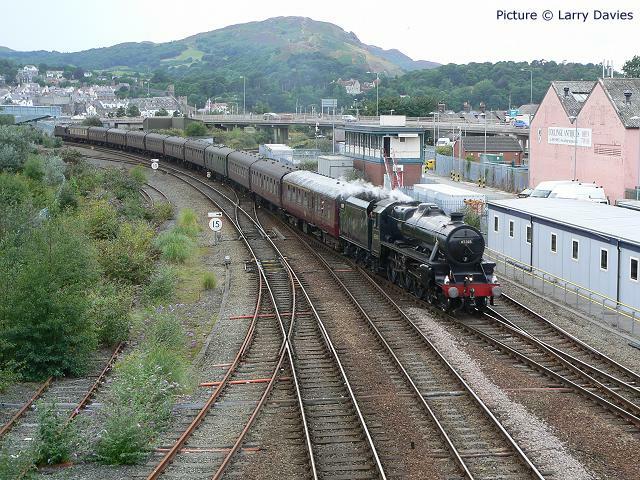 Contrast at Bangor (Alan Crawshaw). 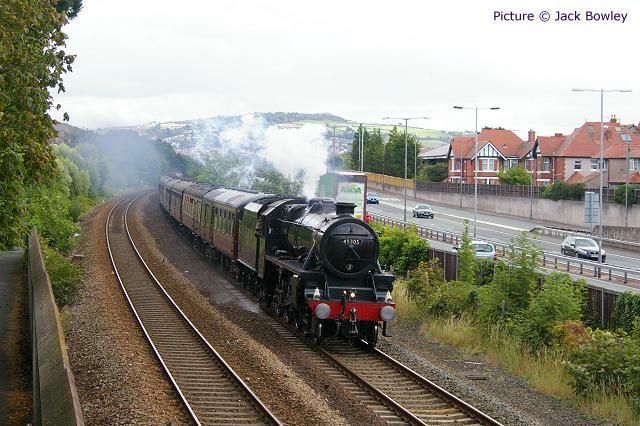 Arriving at Llandudno Junction past 'Sidings Wood' (Larry Davies). 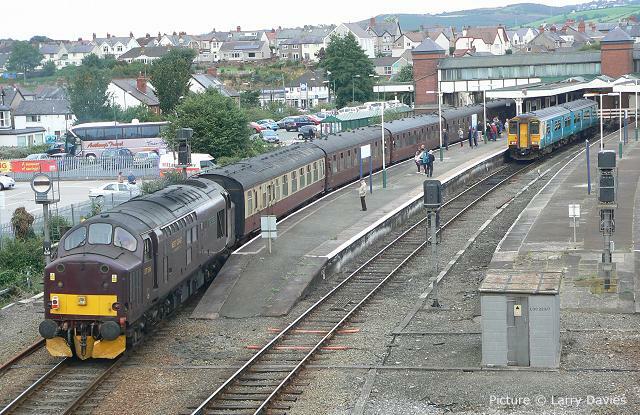 37 516 was 'tail-end Charlie' on the charter – 150 257 lingers in the bay at Llandudno Junction, its duties for the day in the Conwy Valley over (Larry Davies). 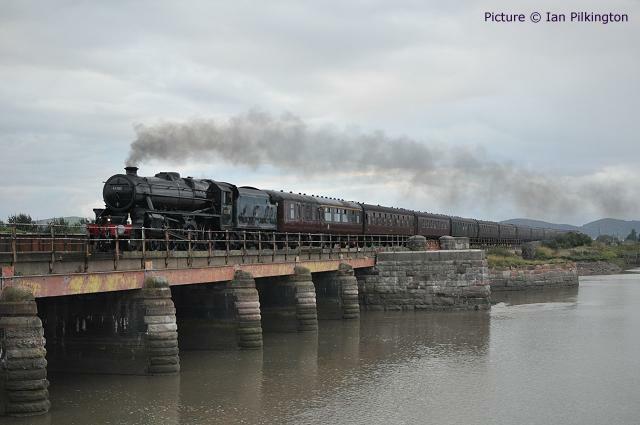 The return working on Foryd Viaduct approaching Rhyl (Ian Pilkington). 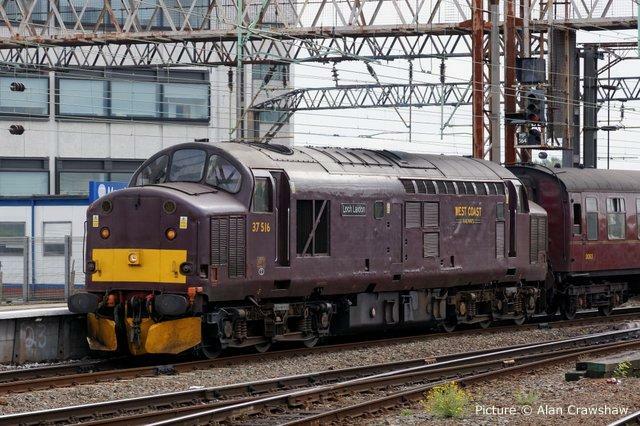 Perhaps only the maroon Mk2 coach behind the loco gives away the fact that this is not 1968. A smoky passage through Rhyl station (Roly High). Sunday 18 August saw not only the steam special, but a Network Rail measurement train top-and-tailed by an odd couple - 31 106 and 37 688. 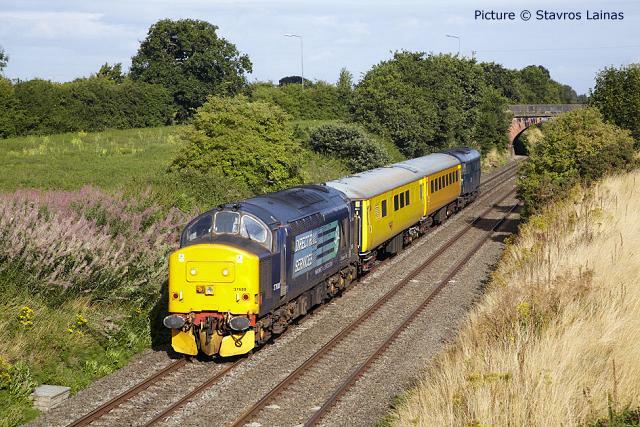 Stavros Lainas was up and about among the pastoral Cheshire scenery of the Crewe - Chester line to photograph it at Waverton at 08:50 (above). 37 688 is on the rear. The working was 08:30 1Q36 Crewe (LNWR site) to Crewe via Holyhead. 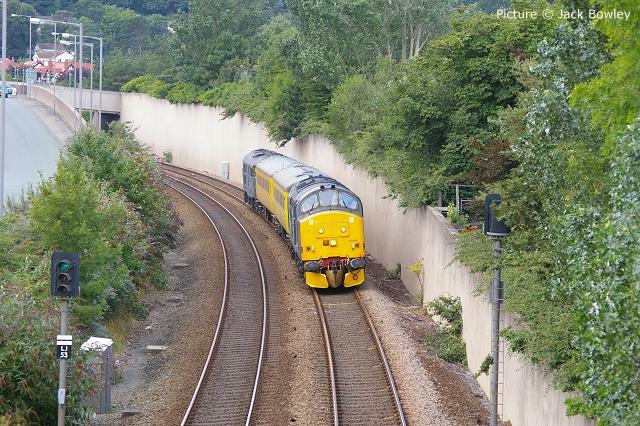 31 106 (above) leading 37 688 through Colwyn Bay on the outward trip (Jack Bowley). The timings allowed a lunchtime break at Holyhead, but this was not taken; Peter Basterfield was not caught out and was at Llanfair PG level crossing to see the train led by 37 688 on the return journey, already an hour early. The train reversed in bay Platform 2 at Llandudno Junction before a run to Llandudno and back. 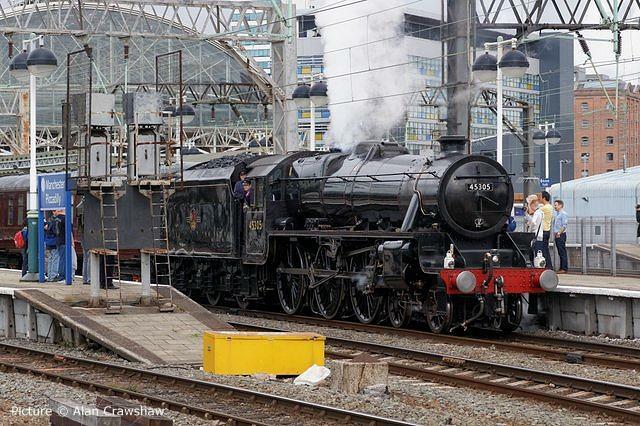 A planned trip to Blaenau Ffestiniog was cancelled, resulting in a very early return to Crewe (Peter Lloyd). 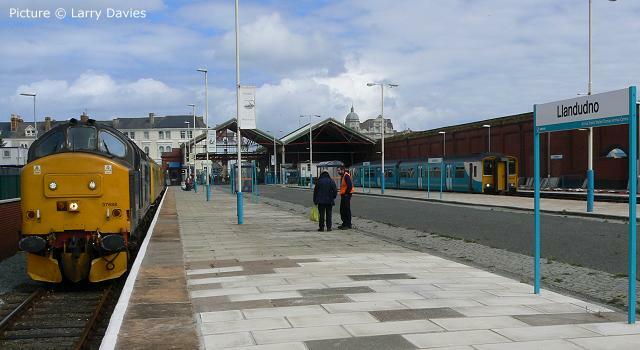 Llandudno Platform 3 – in the background the new car park takes shape (Larry Davies). 37 688 at Llandudno, and 150 257 on the afternoon Conwy Valley service. New 'bus shelters' adorn platforms 2 and 3 (Larry Davies). 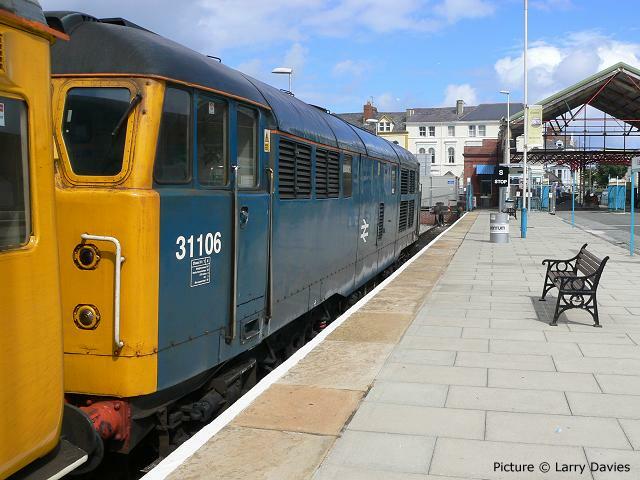 31 106 reminds us of an earlier era (Larry Davies). 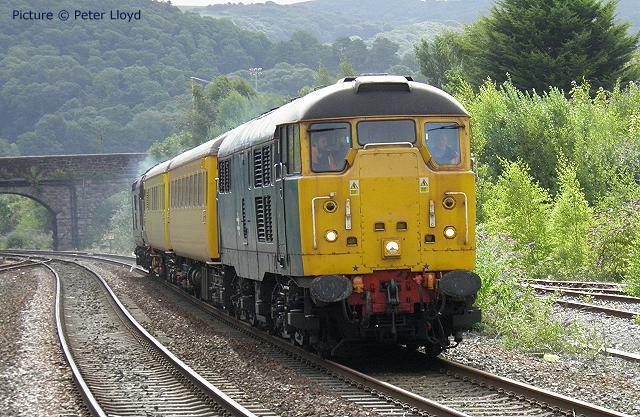 This loco is owned by transport writer Howard Johnston, and managed by RVEL of Derby for use on Network Rail trains. 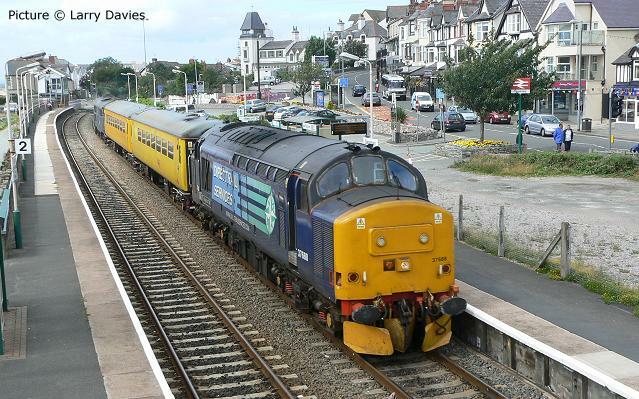 The return working powers through Deganwy (Larry Davies). A snapshot from Realtime Trains shows the early running. The two columns show the planned and actual arrival and departure times at Llandudno. Approaching Colwyn Bay running 243 minutes early for Crewe (Jack Bowley). 31 106 hanging on to the back. (Jack Bowley). This stretch of line near Colwyn Bay was re-located to make room for the A55 road in the early 1980s. 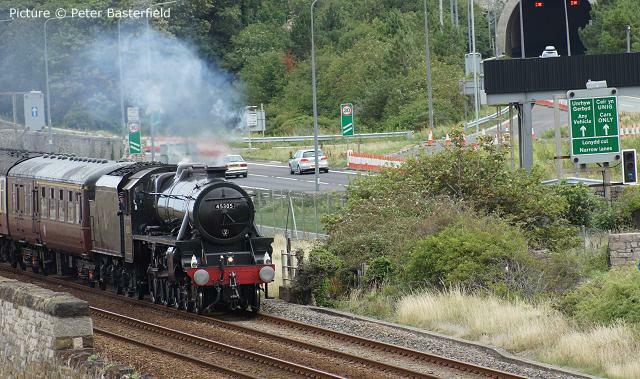 Heading towards Penmaenrhos tunnel at Old Colwyn (Peter Basterfield). line to terminate in Rhyl's platform 1. The destination matrix at the rear of the unit already states that it will not be in service on the return to Chester as train 5D70. 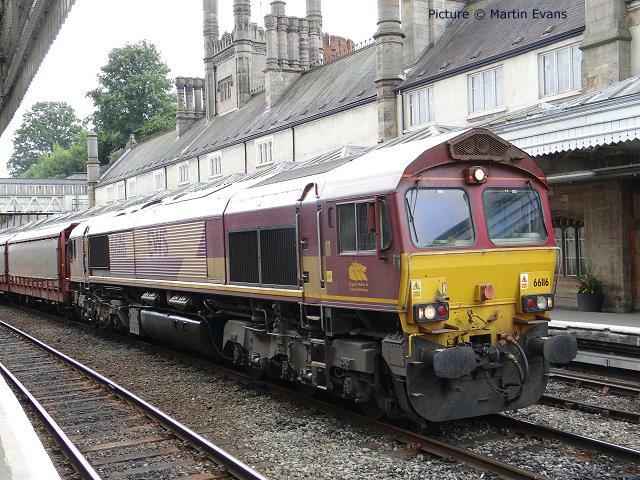 Another look at this picture by Martin Evans from the last issue showing 66 116 at Shrewsbury, unexpectedly hauling empty car transporters on 12 August. 'Can anyone help?' we asked. 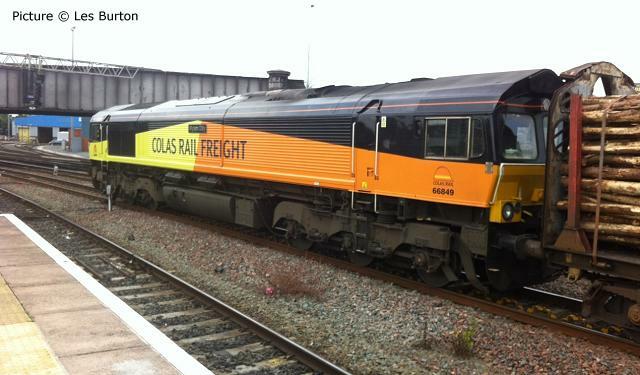 Thanks are due to David White who writes to tell us that sidings at Telford International Railfreight Park, Donnington, which has struggled to gain any regular freight traffic, are being used for repair and maintenance of these wagons. 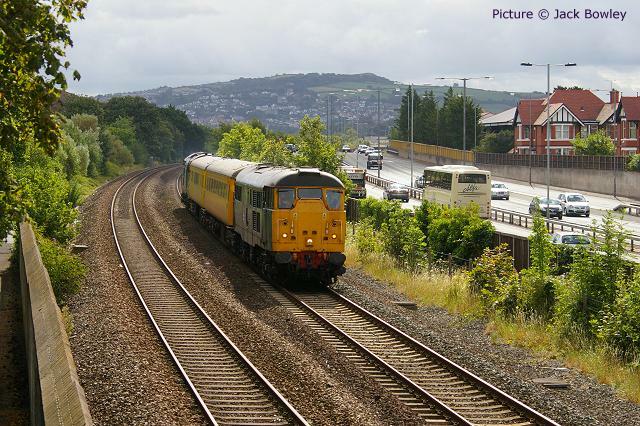 Richard Putley photographed, from a passing train, on 21 August vehicle 57823, part of Arriva Trains Wales unit 158 828, stabled outside Bristol Barton Hill depot (now owned by Arriva since their takeover of Peter Waterman's LNWR operation) on 21 August. 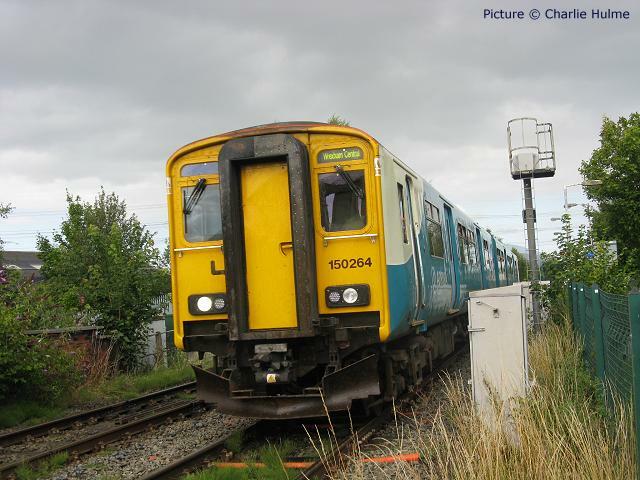 On 16 July, train 1J11, the 10:08 from Birmingham International to Aberystwyth and Pwllheli, comprising 158 823 and 158 822, collided with a tractor and trailer that was crossing the railway at Buttington Hall Farm crossing near Welshpool. It appears that the procedure for telephoning Machynlleth control before crossing had not been followed. Of 140 passengers and three crew members on the train, passengers were taken to hospital for treatment of minor injuries. Two agricultural workers who were standing close to the collision, and the tractor driver, were slightly injured by flying debris. Leading carriage 52823, of 158 823, suffered damaged to its corridor connection, front skirt and coupler - there is a picture in the RAIB preliminary report. Next day, 158 823 was able to move by rail to Barton Hill, and the damaged car is inside the building for repair work. 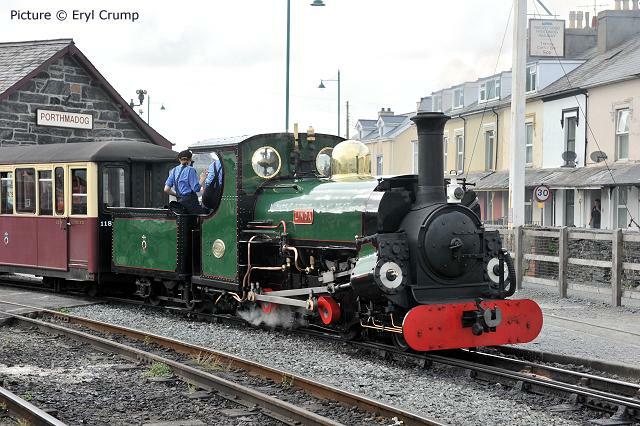 Former Penrhyn Railway locomotive Linda made its first solo run on the Ffestiniog Railway after its recent conversion from oil to coal firing, hauling the on the 18:20 Porthmadog to to Blaenau 'Food on the Move' service on 20 August. A delayed start, delay at Minffordd due to a late running down service, and an unscheduled stop in the woods near Tan-y-bwlch, meant a leisurely trip up and darkness by the time it arrived back at Porthmadog (Eryl Crump). 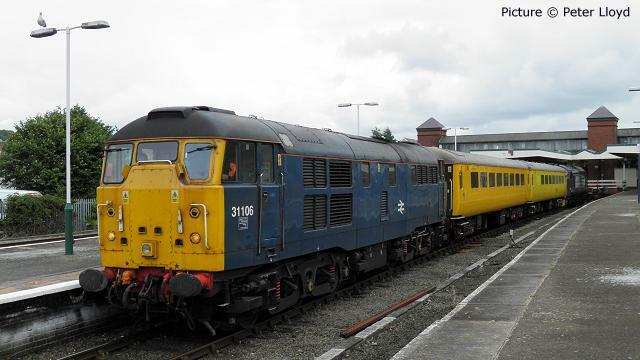 I was hoping to contribute some pictures of the DRS Open Day at Carlisle on 17 August. 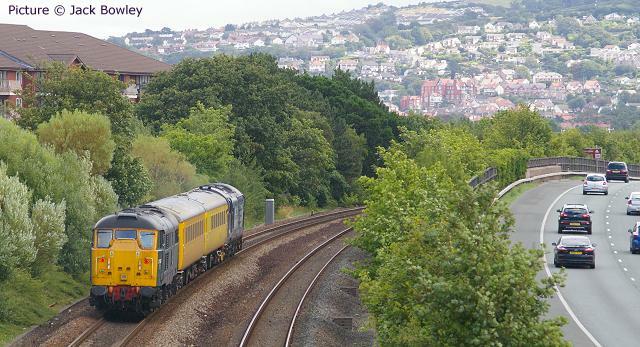 I had planned to go there on a Pathfinder Railtour from Bristol. But on the Friday afternoon I had phone call from Pathfinder to say DB Schenker had cancelled the train due to 'being unable to find a crew'. Unlike the Statesman tour to Aberystwyth that they cancelled at similar short notice last month, this tour did not involve rare routes or traction. It was just a simple out and back trip booked for a class 67, so it is difficult to understand how DBS were unable to find a crew. Since DRS also operate charters I've suggested Pathfinder ask them to run a replacement trip. 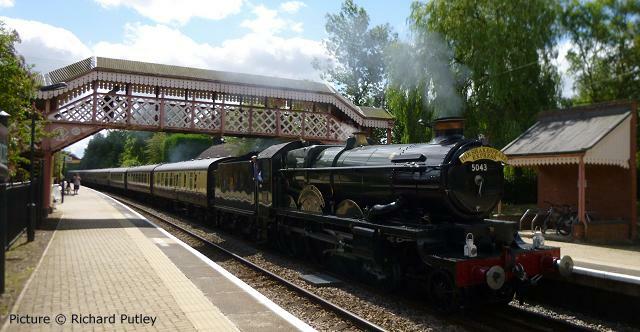 So I consoled myself with watching The Shakespeare Express the following day. I photographed 5043 Earl of Mount Edgcumbe passing through Wilmcote station (above) on the 12:41 Stratford to Birmingham Snow Hill. I then walked along the Stratford Canal to Edstone Aqueduct (completed 1816) where I saw 5043 hauling the 13:58 Birmingham Snow Hill to Stratford. 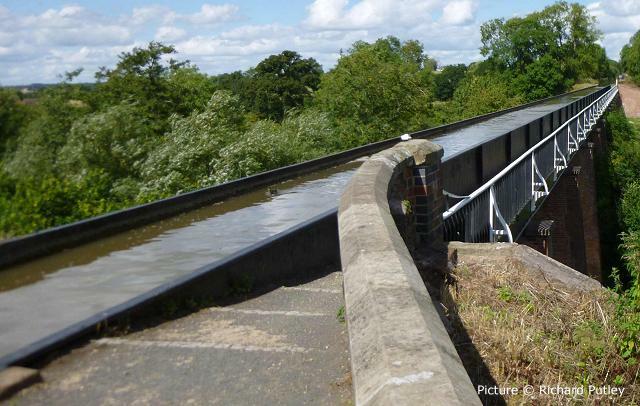 Edstone viaduct is said to be the longest aqueduct in England at 475 feet (145 m)]although less than half the length of the Pontcysyllte aqueduct in North Wales.] It crosses a minor road, the Birmingham and North Warwickshire railway and also the trackbed of the former Alcester Railway. The towpath is unusual as it is at the level of the bottom of the canal. Waiting the road at Chester at 15:25 on 20 August with a log train for Chirk was 66 849 Wylam Dilly. (Picture by Les Burton.) The name was chosen by the pupils of Wolsingham Comprehensive School, and unveiled at Stanhope on the Weardale Railway in 2011. The original Wylam Dilly, built by William Hedley and Timothy Hackworth circa 1813 for the Wylam Waggonway in Northumberland, still exists in the National Museum of Scotland. 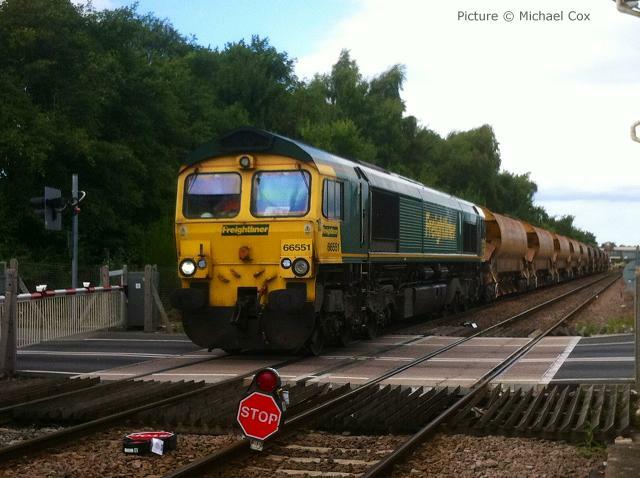 Freightliner Heavy Haul loco 66 651 with a ballast train at Croes Newydd during engineering work on 18 August, as seen by signalman Michael Cox. Early on 22 August, 20 303 and 20 312 head west past Pen-y-clip with the flask train to Valley (Peter Basterfield). Oliver Hambly sends scans of these two booklets from the 1950s from his collection at www.transportpasttimes.co.uk. The Summer 1950 version (left) has 50 Pages of pure nostalgia: Corwen, Ruthin, Mold, Amlwch, Holywell Town, plus much more. Typographically, the cover adheres more or less strictly to the Gill Sans lettering standardised by British Railways, although with the alternative form of capital W in evidence. The summer 1958 version (right) which still costs threepence, displays some individuality of style. 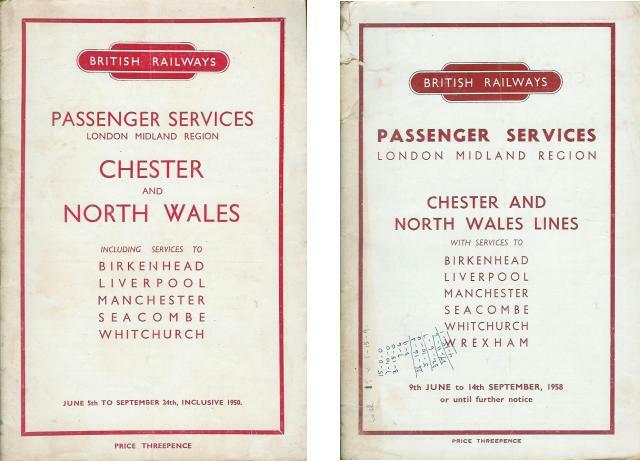 Wrexham appears on the list of stations served in 1958: this may reflect the changes to regional boundaries. Does anyone know?